Hellmann's® Sundried Tomato and Pesto Vinaigrette has the traditional richness of tomato with their sweetness enhanced by the sun, blended with fine oils, vinegar and spices, finished with a delicate basil and garlic pesto. Hellmann's Sundried Tomato & Pesto Dressing is made with real tomotoes, no artificial colors and does not contain high fructose corn syrup. The Hellmann's® brand is recognized throughout the world for unrivaled quality and flavor and its commitment to real, simple ingredients, like tomatoes. 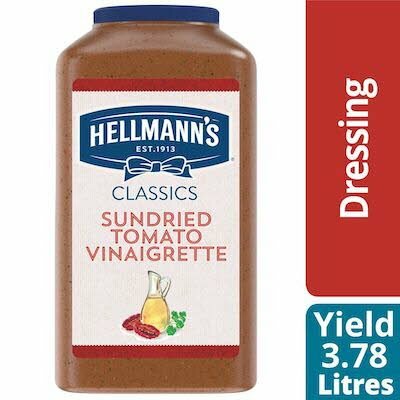 Hellmann's® Sundried Tomato and Pesto Vinaigrette is great on green and bound salads, sandwiches and can be used as a marinade. Mediterranean Slaw: Shredded Savoy Cabbage, diced beets, sliced fennel and sliced kohlrabi all tossed together in the Sundried Tomato and Pesto vinaigrette. This is a great side for game fish dishes and grilled chicken.